It’s 2018 and the company Emax has released what seems to be a considerable upgrade for their already-great Babyhawk drone. This time around the Babyhawk R (R for Racing) seems to haven changed a lot in terms of looks and functionality. But, is it worth the price? And how well does it fly? This review is going to answer those questions and there’s also a video review I made bellow, if you’re not the “reading” type. 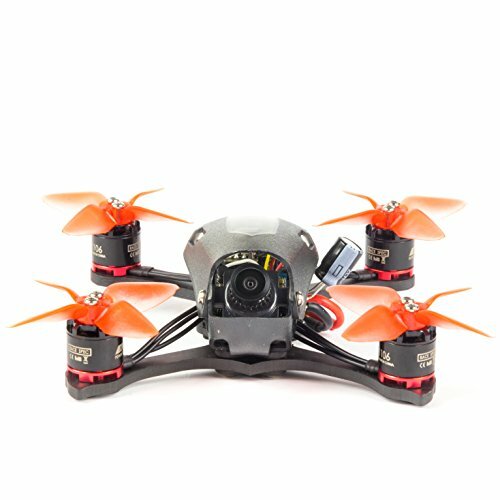 What do you need to start flying the Babyhawk R? As you can see, the upgrade from the previous model is visually very different and looks more aerodynamic and more like a real racing drone. And let me tell you that it also handles like a true FPV racing monster. The capacitor sticking outside that everybody seems to be talking about is actually only a visual problem. I thought it might break off, but in my experience and some other youtubers, it doesn’t have any problem. It’s a bit annoying when you want to connect to the computer through the micro usb slot. So this isn’t an actual issue in my oppinion. The box itself is not that much out of the ordinary, but it does contain the basic parts you need. Keep in mind that you can get this drone without a receiver, or with the standard FRSky receiver and there’s also a 3 inch version (that has slightly longer arms and bigger propellers). The 3 inch version should have more power and thrust, but will go through the battery a little faster. The components of this drone are pretty much top notch. It’s quite amazing you can get it at this price, but it’s probably cheaper than you could build it yourself because the company Emax makes most of the parts themselves. This way they keep production costs at a minimum. These motors are Emax branded and are super powerful. For those who don’t know, the 1106 means the motors are 11 mm in width and 6 mm in height. If you want to find out more about motors check out this article on how brushless motors work. The canopy is made of plastic and comes in different colors, I picked the black version because in my experience is less prone to showing dirt and scratches. It’s nice that you can remove two screws in the back and have access to the components inside. You can also remove the two screws next to the camera and you’ll be able to remove it entirely. The drone has a good airflow and the plastic it’s made of has handled a lot of crashes so far. The frame is 112mm diagonally and it’s made out of 3mm thick carbon. It’s really hard to bend and very resilient, and it’s also up-gradable to a bigger 3 inch version frame. A small disadvantage is that it has about 10 grams added to it just because of the screws needed for a frame that has replaceable arms like this. A drone like the Diatone GT 90 only has a single piece frame, and therefore smaller weight. But the advantage is that you can replace only the arms if they break. It comes with a triple stack containing the ESC, Flight controller and the VTX. The ESC is a 4 in one stack, which means it doesn’t need an Electronic Speed Controller for each motor in part. These ESC’s can run up to 4s batteries at maximum of 12 A and they run BLHeli with DShot. The F3 Flight controller runs Betaflight 3.2.2 and comes with OSD. Which means you’ll be able to see important information directly on the goggles screen. Things like battery voltage, distance, speed and so on. The VTX is basically handling the video transmission process from the camera. This one is 5.8 GHZ, 40 channels and you can switch between the 25 and 200 miliwatts by the press of a button. This is pretty much a Runcam style camera with a wide angle 600 TVL micro 2.1mm Foxeer lens and a CCD sensor. Being a CCD camera is ideal for FPV drone, because of the higher contrast compared to CMOS sensors. This camera is easily replaceable if you want and in my experience works great! I’ve only had problems with some signal interference at higher distances, but that is probably because I forgot to change to 200mw on the VTX. The receiver is the part that connects to the transmitter (controller) and my choice is always FRSky because I use a Taranis Qx7. 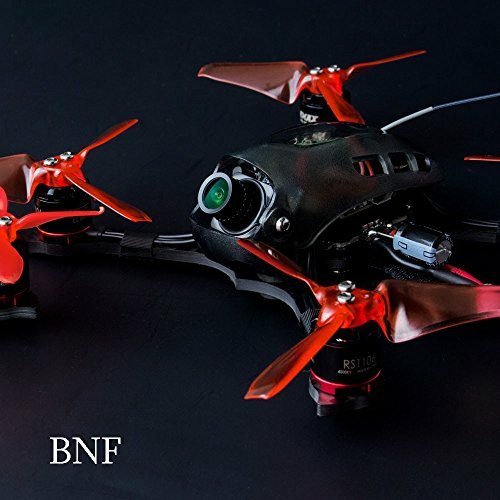 You can choose between getting a BNF version (Bind and Fly) that comes with an EMAX FRSKY receiver installed already, or you can get a PNP version and get an XM+ that has two antennas and is pretty much the best thing you can get now on the market. If you’re a beginner in the hobby and have made sure to learn how to fly in a drone simulator, you’ll need a few more things than the Babyhawk itself. If you’re not a beginner, you might still want to see what batteries are perfect for this quad and what transmitter I use with it. This is what I use for flying most of the time. They are very cheap googles that aren't so big and have a stellar image. You can also record what the camera sees thorugh DVR! I found out the sweet spot when it comes to size for a battery on the Babyhawk R is between 500 and 650 Mah. This right here is a great battery for it and it will maximize its potential. You'll get 8 total props in the package, but that won't be enough in the long term. So better stack on a lot of these props if you want to have fun for a long time. If you get the PNP version you'll need to add you own receiver. This one is one of the best that work with the controller above. If you’re looking for the absolute best items, I would recommend getting a better pair of goggles, called the Aomway Commander. They are lighter in size, have slightly better sygnal and many aditional functions. They are also like 3 times more expensive, but it’s a good investment if you’re going to stick to the hobby. Compared to the standard Babyhawk that could only run a 2s battery, this one can go up to 4s. I have recommended you go for 3s batteries, but if you prefer flying truly fast and insane go check out a nice 4s battery and get impressed. In my experience, I must say I was shocked how smooth the drone flew and how pitchy it is. 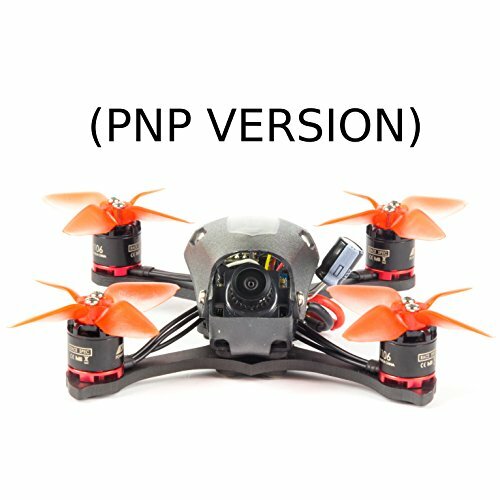 I’d say that if you want a reliable yet compact FPV quadcopter, there’s not much else you could want. The price is totally fair, and I would actually say it’s cheaper than expected. Especially if you use the coupon code RC18OFF on Gearbest. The Babyhaw R is a great upgrade from the previous version and I’ll be having fun with it for quite some time, because it’s hard as hell to destroy! Great review! Thanks Paul, I’m convinced to buy one. Thanks, Doru! I bet you were almost convinced even before seeing my review!